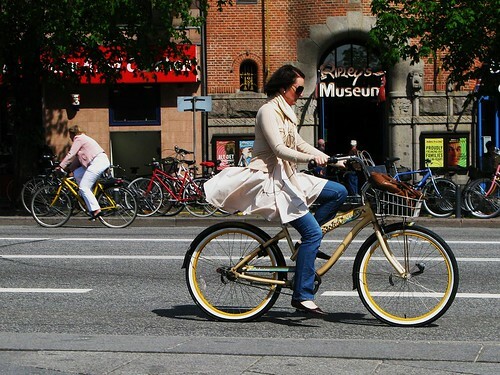 These cruisers are all the rage in Copenhagen, in the 15-25, female demographic group. I'm over 50, and love my blue Electra Townie cruiser! Your blog has inspired me almost as much as my visit to Amsterdam last summer. I am riding my bike everywhere these days, and the only reason I don't wear high heels on my bike, is because I don't wear high heels to walk either! And your blog is a bis success here in Brazil. I love her style with the fabulous jacket-so chic! thanks for the comments. cool photo, rafael! In Montreal, the cruisers is everywhere. It's the american look of the european style. More style, less speed... Next big thing. Maybe because we dont have Velorbis and Batavus bikes.